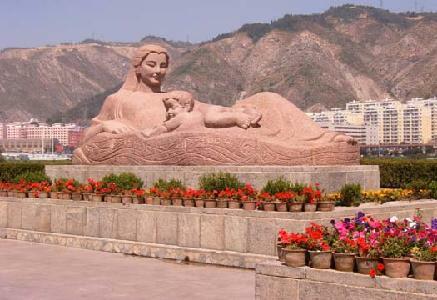 This is a follow-up post on my last one in relation to the Yellow River Mother Sculpture in Lanzhou, as some of my readers are interested in knowing more about the significance of Yellow River in the Chinese history. “From the earliest times in the history of humankind, water, in the form of lakes, seas, and especially rivers, has played an essential role in the development of civilization. This is a truth universal to cultures throughout the world. And the great amount of archeological information available about ancient Chinese civilization tells us that their ways of life were greatly influenced by the Yellow and Yangtze River civilizations. The Yellow River, in particular, was essential to the development of Chinese civilization. In Chinese history, and in the history of human civilization, the Yellow River is not simply a set of characters on a page and the name of a river. In fact, it stands for a kind of culture and civilization. Undoubtedly, the Yellow River civilization has played a very great role in the development of civilization across the globe. For thousands of years, the river has been known as the mother river of the Chinese nation, both in the writings of the poets and scribes, and in the hearts of the Chinese people. Almost all the Chinese see themselves as the children of Yellow River. It is said that Egypt is the gift vouchsafed by the Nile. If there were no Nile, then it is hard to see how there could be an Egyptian civilization. The Yellow River has the same relationship with China. If China had no Yellow River, the Chinese wouldn’t have a place to focus their spiritual energies on. Yellow River Piano Concerto, first movement, performed by Lang Lang.